AUD lost its momentum after Lowe’s claim that the Central Bank is not going to raise interest rates. 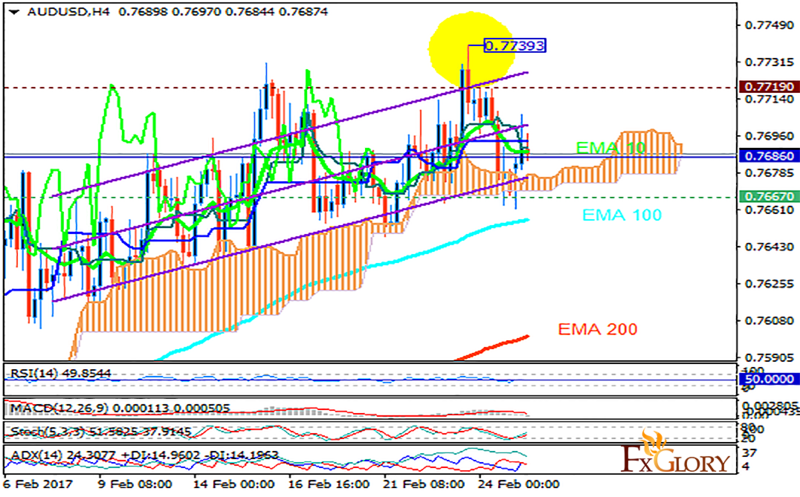 The support rests in 0.76670 with resistance at 0.77190 which the weekly pivot point at 0.76860 is located in between the lines. The EMA of 10 is moving with bullish bias along the ascendant channel and it is located above the EMA of 100 and the EMA of 200. The RSI is rising towards the 50 level, the MACD indicator is in neutral territory and the Stochastic is showing upward momentum. The ADX is showing a buy signal. The price is in the Ichimoku Cloud and above the Chinkou Span. The Tenkan-sen is showing a downward trend while the Kijun-sen is showing a horizontal trend. There are no clear signals at the moment so traders can wait for a better chart setup.